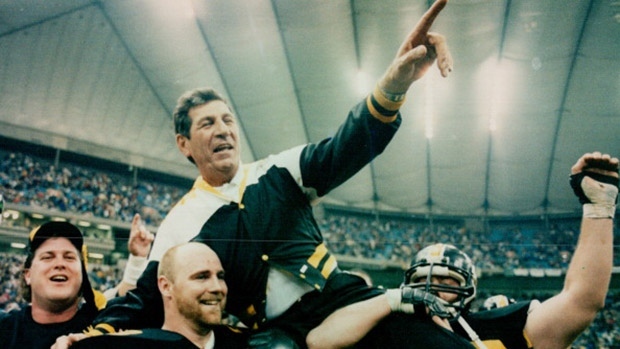 Al Bruno, coach of the Hamilton Tiger Cats from 1983 to 1990, when he led his team to a shocking upset of the Edmonton Eskimos in the Grey Cup at B.C. Place in Vancouver. It may have been one of the biggest upsets in Grey Cup history, but in a lot of ways it was a long time coming. When the Hamilton Tiger Cats hoisted the Grey Cup in 1986, it was the culmination of three years of hard work and futility. The recent death of Al Bruno, who coached that team, brings back all those memories of sorrow that turned to joy. It was late in the 1983 season when Al Bruno, who had been Hamilton’s director of player personnel, was named head coach after the Tiger Cats fired Bud Riley. He finished the season with two wins, a loss, and a tie, giving the Tiger Cats an overall record of 5-10-1, tied with the Montreal Concordes for third in the East. However, a tiebreaker meant Hamilton was good enough for third place in the East Division and a date with the Ottawa Rough Riders in Lansdowne Park in the nation’s capital. Ottawa led late, but Hamilton’s Keith Baker returned a punt deep into Ottawa territory, setting up the winning score for Hamilton, who won 33-31. It was the last playoff game Ottawa ever hosted. The win put Hamilton into the East Division final against the Toronto Argonauts, who had gone to the Grey Cup in 1982, losing to Edmonton, and finished first in the division in 1983. The Argos prevailed by a score of 41-36, and went on to beat B.C. for the Grey Cup with a thrilling 18-17 win. Hamilton’s playoff success was a sign of things to come. The 1984 season would be a chance for Al Bruno to start the season as head coach. In his first full season, he would have mixed success. The Tiger Cats started with a win over Montreal and a tie with Saskatchewan. That 1-0-1 start quickly descended into anarchy as Hamilton dropped six straight games. It took another date with the Montreal Concordes to snap that losing streak. However, two more losses followed and the Tiger Cats were 2-8-1 when they hosted my beloved Calgary Stampeders. It should have been a breeze. Apparently the Stampeders thought so too, losing 29-26. That win was a sign of things to come. The Tiger Cats lost by a touchdown to Edmonton the following week, but that would be their last regular season loss. They reeled off three straight wins against Saskatchewan, Ottawa, and Toronto to finish the season 6-9-1 and one of the hottest teams going into the playoffs. Hamilton finished with the same record as Montreal, but took second place on a tie breaker, setting up a showdown in Hamilton in the East Semi-final. The Tiger Cats won that game, setting up a re-match with the defending Grey Cup champion Toronto Argonauts in the East Final in Toronto. This time, it was Hamilton who prevailed, by a score of 14-13, to punch their ticket to Edmonton for the Grey Cup. Awaiting them in Alberta’s capital was the Winnipeg Blue Bombers, champions of the West and the consensus best team in the league. Earlier in the year the two teams had traded quarterbacks, so it was a chance to see who got the better deal: Winnipeg with Tom Clements or Hamilton with Dieter Brock? The Bombers proved it. After Hamilton took an incredible 14-3 lead after one quarter, Winnipeg exploded for 27 points in the second quarter and another 10 in the third while shutting Hamilton out the entire second half. By the time the smoke cleared, Winnipeg had won the 72nd Grey Cup going away, by a score of 47-17. Although they got bombed at Commonwealth Stadium, Hamilton was still a step closer to the Grey Cup than the year before. Dieter Brock bolted for the Los Angeles Rams of the NFL, leaving Hamilton searching for a starting quarterback. They found their replacement in the form of a man who had lit it up throwing the ball in college football at Idaho, but as a pro bounced around the United States Football League. As prolific a passer as Ken Hobart had been, it would be his legs that carried the Tiger Cats back to the Grey Cup game. Once again, it was an up and down season. Hamilton started with three straight losses before winning against, you guessed it, Montreal. However, that was followed up with three more losses before a second win over Montreal. So, halfway through the season, the Tiger Cats had two wins against the Concordes and were winless against the rest of the league. What soon became apparent was Al Bruno’s team were much better finishers than starters. After losing to Edmonton to start the second half of the season, Hamilton reeled off three straight wins against Toronto, Ottawa, and Calgary, before losing to the Eskimos again to fall to 5-8. They would not lose again to close out the season, with victories over Saskatchewan, Ottawa, and Calgary to finish at 8-8, good enough for a share of first place with Montreal. However, the Tiger Cats were awarded first on a tie breaker. They were inching closer and closer to that Grey Cup championship. After Montreal defeated Ottawa by a score of 30-20 in the East semi-final, they travelled to Ivor Wynne Stadium to play the Tiger Cats in the East Final. On the line was a trip to the Grey Cup in Montreal. The Tiger Cats quickly extinguished any hopes the Concordes had of hosting a Grey Cup, blowing them out by a score of 50-26. Awaiting them in Montreal were the B.C. Lions, champions of the West who dispatched the defending Grey Cup champion Winnipeg Blue Bombers by a score of 42-22. Hamilton had been led all year by Hobart who used his legs as much as his arms, rushing for 928 yards, a record for quarterbacks at the time. Keep in mind the league still played 16 games, unlike the 18 they play now. He also passed for 2,522 yards, 19 touchdowns, and 14 interceptions. He was also named the most valuable player of the East Division, and was runner-up for league most valuable player to Mervyn Fernandez of the B.C. Lions. The Lions jumped out to a 10-0 lead after one quarter and extended that to 13-0 before Hobart went to work. He threw touchdown passes to Ron Ingram and Johnny Shepherd to give Hamilton a 14-13 lead with 1:35 left in the half. However, disaster struck. B.C. quarterback Roy Dewalt hit Ned Armour on a 59-yard touchdown pass then James “Quick” Parker knocked the ball loose on the ensuing Hamilton possession, giving the Lions the ball with a chance at a late field goal. B.C. kicker Lui Passaglia made no mistake and the Lions led 23-14 at the half. The Lions kicked two more field goals in the third quarter while the defence shut out the Tiger Cats, making it 29-14 after three quarters. Hamilton kicker Bernie Ruoff booted a field goal to start the fourth quarter, before Passaglia kicked a single. Dewalt then hit Jim Sandusky for a 66-yard bomb and a 37-17 lead. Again, Hobart did not give up, eluding the B.C. pass rush and hitting Steve Stapler for a 12-yard touchdown late, narrowing the gap to 37-24. But that was as close as Hamilton would get, and it was B.C. who won the Grey Cup, dashing Hamilton’s hopes again. Still, the Tiger Cats, by finishing first in the East, had inched a step closer to the Grey Cup. The two-time defending Eastern Division champions came into the 1986 season with high hopes. They would again utilize a rookie quarterback, this time it was Mike Kerrigan, to turn their season around. They once more started slowly, losing four of their first five games, before beating Saskatchewan then Montreal back to back for a 4-5 record halfway through the season. The 1986 season was the first year the CFL played an 18-game schedule. Once more, Hamilton was a second half team. After losing to arch-rival Toronto, they tied Saskatchewan then beat Calgary and Ottawa to reach the .500 mark for the first time all season. That was short-lived, with back-to-back losses to Edmonton, dropping their record to 6-8-1. That would be the last time they lost all season. They closed out with three straight wins, over B.C., Toronto, and Ottawa, for a 9-8-1 record, good enough for second place in the East. Arch-rival Toronto was one-half game better for first place. The CFL, sensing the imbalance between West and East, changed the playoff format that season. Instead of the top three teams in each division making the playoffs, the top two automatically qualified. If the fourth-place team in one division had a better record than the third-place team in the other division, the fourth-place team made the playoffs. Unlike the system today, where that team crosses over, back in 1986 the team stayed in their own division. That meant Edmonton played Calgary and B.C. played Winnipeg in the West, with the winners playing for the West Division title. In the East, Toronto played Hamilton in a two-game, total-point East Final with the winner going to the Grey Cup. The first game was in Hamilton on Nov. 16, and the Argonauts, led by quarterback J.C. Watts, beat Hamilton by a score of 31-17. Game 2 was one week later, on Nov. 23, in Toronto, and Hamilton had to win by at least 15 points. Kerrigan had a great game and the Tiger Cats won by a score of 42-25 to win the series by a total score of 59-56. Hamilton was off to their third straight Grey Cup, this time at B.C. Place in Vancouver. Once again, Hamilton was a heavy under dog, facing the Edmonton Eskimos who had defeated Calgary then B.C. The Eskimos came into the game double-digit favourites, having swept the season series with Hamilton, and everyone expected them to hand the Tiger Cats their third straight heartbreak in the national final. The game was never really close. Hamilton always had a good defence, but on Nov. 30, 1986, they turned in one of the best performances in recent memory. They were led by pass rusher Grover Covington, linebacker Ben Zambiasi, and a ball-hawking secondary featuring Mark Streeter and Howard Fields. They would sack Edmonton quarterbacks Matt Dunigan and Damon Allen a total of 10 times, and tie a Grey Cup record by forcing eight turnovers. Hamilton opened strong as Covington knocked the ball loose from Dunigan and the Tiger Cats recovered. Kerrigan took advantage immediately, hitting Steve Stapler for a 35-yard touchdown pass. The next big play I remember vividly. Edmonton was backed up deep and forced to punt. Streeter got in and blocked Tom Dixon’s punt and Jim Rockford – who had played with Oklahoma and J.C. Watts back in the 1981 Orange Bowl – recovered the ball in the end zone for another touchdown. Kicker Paul Osbaldiston later kicked his first of five first-half field goals to make the score 17-0 after one quarter. I never liked the Eskimos and was lapping this game up. The hits kept on coming, as Osbaldiston added four more field goals in the second quarter, benefitted by great field position provided by the defence, including an interception by Fields. The defence allowed a total of minus-one yards offence in the first half as Hamilton took a 29-0 lead into the dressing room at halftime. It was. Kerrigan connected on another touchdown pass, this one for 44 yards to Ron Ingram. That upped the score to 36-0. Finally, Edmonton showed signs of life as they blocked a punt setting up a touchdown by Allen to make the score 36-7 after three quarters. Part way through the fourth quarter, Allen hit Brian Kelly for a touchdown then the quarterback ran the ball in for a two-point conversion, making the score 36-15. That was it for Edmonton. Osbaldiston tacked on his sixth field goal of the game in the last minute of the game, tying a Grey Cup record. When the final gun sounded, Hamliton had won 39-15, earning their first Grey Cup since 1972. They also avenged a 48-10 loss at the hands of the Eskimos in the 1980 Grey Cup, the only other time the two teams ever met in the Grey Cup. Mike Kerrigan was named the games most valuable player on offence, Grover Covington was the most valuable player on defence, and Paul Osbaldiston was named the most valuable Canadian. Covington finished the game with three sacks while Zambiasi recovered two fumbles, and recorded a sack and six tackles. Coach Al Bruno finally had his Grey Cup championship. The Tiger Cats would finish third in the East in 1987 and 1988, losing in the East semi-final both years. They would return to the Grey Cup in 1989, where they lost to Saskatchewan in what many observers describe as the greatest Grey Cup game in history. A year later, 12 games into the season, the Tiger Cats were sitting at the bottom of the division with a 4-8 record, and Al Bruno was fired, never to return to the sidelines in the CFL. He finished with a career record of 56 wins, 55 losses, and three ties from 1983 to 1990. His record is deceptive, because if there was one thing Al Bruno could do, it was win when it counted. Year after year his teams started slowly, but finished strong. He did benefit from playing in a weak division, which in part accounts for his four appearances in the Grey Cup, but he did win one Grey Cup as a 12-point under dog, and came within a last-second field goal of winning a second. With two straight losses in the Grey Cup championship, the Hamilton Tiger Cats were poised to be the 1980s CFL equivalent of the Buffalo Bills. It would be an interesting irony given how close the two cities are geographically. However, Al Bruno prevented that from ever happening. Instead, he engineered one of the most shocking and decisive upsets in Grey Cup history.